I've been focused on your Flipbook Maker for a long time. It is the one has impressed me the most. Recently I have used Flipbook Maker to upload publications online. Now I want to change the title of online publications for SEO, but I have no idea. Can you help me? Flipbook Maker not only allows you to publish flipbook online, but also manage those online books easily. With the help of "Manage Online Books", you can edit, share and even delete online flipbook. 7. Input the new title and description for your book. Click "OK". 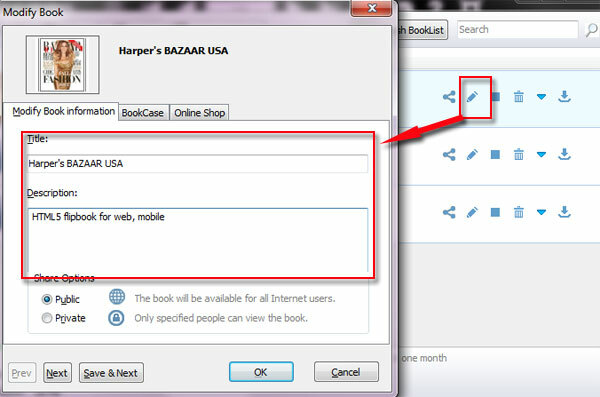 Besides, you can also easily share your book to friends via email and social network in manage book panel.